There's a bright light at the end of the tunnel--- finally. Most of the really well respected, long term investors are advising their audiences to hang in there, to stop the panic selling, and to look for the great companies that have withstood the economic downturns of the past. Buffet, Bogle, Gross, Schwab, and company offer sound advice--- don't run and hide, it's time to hit the Wall Street Mall and go shopping! They've seen the indicators; they've been there before. So have many of you. Clearly, it's time for action. With IGV stock prices down 50% or more, and income securities as low or lower, Chuck Jaffe points out in MarketWatch that the case for loading up on managed Closed End Funds (CEFs) is a strong one. The great companies are in garage sale mode, and managed CEFs are selling at an additional 25% below net asset value (NAV). Jaffe writes: "With investments, investors can only guess at how big a bargain they are getting. The one exception is CEFs, where investors looking for both bargains and income streams get a price tag that shows the actual amount of their discount--- an intriguing choice for current market conditions." Jaffe emphasizes that investors "look inside" the wide variety of CEFs out there, and there are excellent educational websites, like ETF Connect, for hands on research. He quotes investment manager Jerry Paul, who feels that "the buying case is pretty clear", and that "the best times for closed end funds have been in crisis environments". The CEF idea, in both equity and fixed income portfolios, boils down to this lightly edited commentary from an old friend that brainwashing book readers know as Deep Pockets: "Closed end funds are misunderstood investments and perhaps that is reflected in their volatility." "Seems to me that the leverage on the funds would be the cause of concern, yet the taxable funds like Blackrock are not leveraged yet seem to have the same volatility as the leveraged funds. Credit risk could be another cause of concern, yet the insured municipal funds seem to be as volatile as the uninsured." "As you have pointed out, overall income streams have been stable, yet double digit yields are all over the place. Fixed income assets are on SALE because of the decline in the bond market and thus the reduced net asset values." "Additional opportunity exists because the Market Values of CEF stocks are at huge discounts to their already lowered NAVs. It is like the 25% markdown sale items are reduced by an additional 25% for no reason other then fear and misunderstanding." "Looking at prior periods of panic in the markets, closed end funds historically have big rallies toward the end of bear markets. 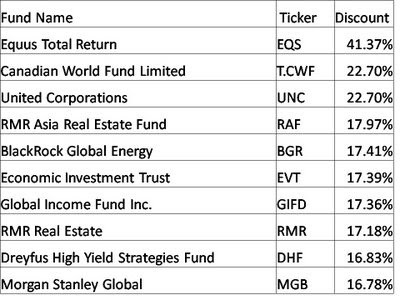 2003 saw many closed end funds achieve returns of 25-30% in just twelve months. Those who locked in high rates during panic-selling enjoyed high income streams going forward, long after the markets turned up and current yields went down." Light One: "The credit markets are beginning to thaw, with LIBOR rates coming down and commercial paper markets starting to function more normally. Some of the fear of systemic failure is abating"--- and the Fed cash infusion has not yet started. Light Two: "Oil prices are dropping back into normal ranges, increasing the purchasing power of consumers", and reducing the costs of getting goods to market--- but hopefully not enough to discourage conservation and US development efforts. Light Three: "The price of gold has fallen, a normal sign that fear and panic have lessened." Light Four: "The dollar has risen to multi-year highs against many currencies increasing confidence that we will lead the global recovery"--- no matter how bad you paint the picture, there's always a recovery. Light Five: "You just don't hear too much about inflation anymore"--- and prices just haven't fallen as they would if things were looking even worse. Light Six: "The few up days lately on Wall Street have inspired huge volume, while the volume on down days is falling"--- remember, buyers tend to hold on for profits down the road. Light Seven: "The 2009 P/E ratio estimates for S & P 500 companies are historically low." Light Eight: "Dividend yields on common stocks are historically high." Light Nine: One huge element of economic uncertainty will disappear in early November, and most would agree that this too has been discounted. Typically, the media will place more emphasis on good news during the honeymoon period. The rally is in your hands people, let's get out there and party! How? Buy back into your 401(k) value funds, add to your personal portfolios (particularly those high yielding income CEFs), and stop taking losses on solid, mainstream, dividend-paying companies. We provide Free intraday stock trading advice, Short, medium and Long term tips and advice for people to make profits from the stock market. Its a great blog..Really, i m impressed by your writing style..keep the good working.